On May 16 and 17, 2017, a peer exchange for local agencies on asset management was held in St. Cloud. The meeting focused on the needs and interests of small, rural cities and counties and was inspired by a similar peer exchange held last year for metro-area agencies. It provided an opportunity for participants to explore a variety of issues and challenges surrounding transportation-related asset management. A summary of the meeting is on the Minnesota LTAP website. Several of the presenters brought to light the fact that tools and technology are often unknowingly already available to agencies. Another presenter showcased the efficiencies, cost savings, and consistency in data gathering made possible by sharing staff between different agencies that could not afford a position on their own. These agencies were able to efficiently collect high-quality data on their assets at a fraction of the cost as a result of shared personnel resources. 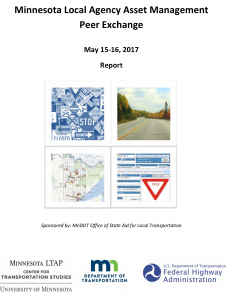 The event was sponsored by the MnDOT Division of State Aid for Local Transportation and coordinated by the Center for Transportation Studies at the University of Minnesota with financial assistance from the Federal Highway Administration.